1. The machine is suitable for large punching molding and cutting die. 2. The machine is fit for blister con cutting in perfect cutting location. 3. Operation quietly, simple and safety. Two steps speed controlling. The slow speed is employed for install the new mould which including top and bottom mould with an accurate cutting location request. 4. 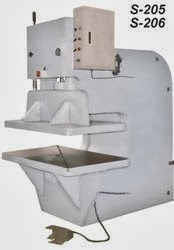 The machine is also suitable for punching mould and cutting die mould. The slot profile of table surface can be processed as the customer request.